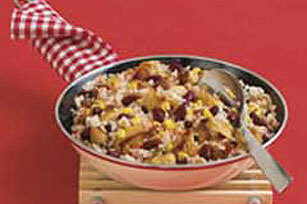 Whole kernel corn, chunky salsa and kidney beans give this chicken and rice dish its tasty Southwestern cred. Heat oil in large skillet on medium-high heat. Add chicken and onion; cook and stir until chicken is cooked through. Add beans, salsa, corn and broth. Bring to boil. Stir in rice; cover. Remove from heat. Let stand 5 min. Garnish with BREAKSTONE'S or KNUDSEN Reduced Fat Sour Cream.